There’s a little thrift shop about a mile from my home that I was visiting every other week or so. They never really seemed to have anything that was interesting, and at first, the only reason I stopped there is that they are open on Mondays, and all the other thrift shops in my area are closed on Monday. Then one day, as I was walking out empty handed, I noticed a small poster on the wall behind the cashier. It said that all profits were used to help children with Cancer. I asked the cashier if they could really do much to help the children when business seemed to be so slow. She took an album from under the counter and started showing me pictures of children that they had taken on trips to Disney World, Universal Studios, Sea World, or any of the other attractions around Orlando. The cashier said the charity had even paid for the surgeries for some children, and for air fare to fly the child somewhere for treatment. She said even though business was bad, they always managed to get some very large donations from local residents and businesses. I asked what was the largest donation they had ever received and I almost fell over when she said seven hundred and fifty thousand dollars. That’s three quarters of a million dollars! She went on to say a lot of people gave $25,000 or $50,000. Wow, there’s a lot of wealthy and generous people around here. The woman that owns that shop lost a child to cancer. Now, she donates her time to work in the store, as do all the other people that work there. In my opinion, there is no charity more worthy than those that benefit children that are ill. I’m not one of those wealthy people, but I did give the lady a $50, and told her I’d see her next Monday. The next Monday I was at that same thrift shop, standing in front of the door, when they opened at 10 AM. As soon as I walked in I noticed a sign by the cash register that said 50% off of everything. I asked the lady why such a drastic discount and she told me they were busting at the seams, the back room was full and they had run out of places to put stuff. I started browsing through the store and right away I noticed a table piled high with vintage and antique dishes, plus a few bowls and platters from various manufacturers. I was sure some of the pieces would be something a collector might want, so I told the cashier, “I’ll take everything on the table”. She started wrapping and packing the china and I kept browsing. Soon I spotted an old General Electric Waffle Iron and a Sunbeam Percolator Coffee Pot. I took both of those to the cashier and told her I was ready to check out. After the 50% discount, the total was $68.40 with tax. Over my daily thrift store budget, but I got some really nice stuff, including the coffee percolator, waffle maker, a large platter, a large oval covered vegetable dish, a cup & saucer, and two dinner plates all in the J. & G. Meaken “Long Branch” pattern and in mint condition. There were also assorted pieces of collectible china. I scored some really nice stuff and most important, the money went to a very good cause. Now when I visit a “charity” thrift store that I don’t know much about, I always ask which charities they support. One thrift store owner told me a portion of the profits go to feed the homeless. I asked what percentage of the profits he donated and he said, “it varies”. Now I’m all for feeding the homeless, but I’d feel a whole lot better about it if he had given me a straight answer, something like 50%, or 100%. That shop that helps children with cancer is my favorite place to shop now, plus there’s another shop I found that helps Autistic Children. If you shop at thrift stores, and there’s a lot of them in your area, you might want to consider spending your money at those shops that help children in need. You just might enjoy shopping a whole lot more. I don’t know whether to call this a sad story, or a tale about one of the times when I thought I knew too much. On this particular day I had more cash in my pocket than I normally have when I go to garage sales, or estate sales, about $900. My first stop was at a moving sale where the people were moving out of the country and everything was for sale. I spent close to $300 and the most expensive thing about was $15. Prices were very good. My next stop was an estate sale. Three daughters were handling the estate of their mother who had passed at the ripe old age of 92. Both parents had been professional dancers and had traveled the world on tour with a dance show. The first thing that caught my eye was a table full of Coco Chanel purses, handbags, clutches, shoulder bags, wallets etc. There were about twenty of the Coco Chanel goodies. Prices ranged from $90 to $800 depending on the age and condition of the item. My knowledge of Chanel products was very limited and I didn’t feel comfortable spending that kind of money on something that was new to me. So, I left the sale and went home, just a couple of miles away, to research Coco Chanel Purses and handbags. After spending ten minutes or so on the computer I felt that I knew enough to make an investment in one of the Chanel pieces. When I got back to the sale all but seven of the bags were gone and two of those were Bottega Veneta brand, something I’d never heard of. I decide to play if safe and but one of the older, no so expensive Chanel bags. The bag I had really wanted was gone and what I should have done is leave the sale, or look at other things beside the bags. Anyway, I picked out a nice $130 off white little clutch that the daughter said her Mom had bought in Paris sometime in the 80’s. The label in the bag said, made in France so that seemed to check out. The bag didn’t have the hologram, or serial number that Chanel bags are supposed to have, but I had just read that Chanel didn’t start numbering their bags until 1986. OK, the bag looked and felt like quality, like a $2000 bag, and since Mom bought it in Paris in the 80’s it must be one of those that they made before they started with the serial numbers. I’m going to buy the bag and sell it for six or eight hundred, probably. I called the daughter over and tried to negotiate the price. I offered $100, she said no, I offered $110, she declined. She said she had to get $130 for it because the three daughters had agreed not to drop the prices on any of her Mom’s clothes, accessories, or jewelry. I still had a pocket full of cash so I gave her the $130 and went on to the next sale, feeling pretty good about my purchase. A few weeks later, I decided to list the bag on ebay to make a quick few hundred dollars. I took some nice photos and listed the bag around 7:00 PM on a Saturday. Then I went to hang out with some friends. Sunday morning, when I checked my email, I had an email from ebay saying that they had removed the listing for the Chanel bag because it was a fake. They said if I re-listed it they would suspend my account. I’ve sold almost 2,000 things, with no problems, on ebay and I certainly didn’t want my account suspended. My feedback is 100% positive so I’m not going to test them. I tried to give the bag to my neighbor, but she said she never goes anywhere to use it. She said I should give it to my daughter who lives in North Carolina. I called my daughter and she already had three of the Chanel fakes that she bought at a flea market. I tried to give it to my Granddaughter but she said she doesn’t carry a purse and if she did that one would be too small. I came close to putting it in the dumpster behind the ABC Liquor store across the street, but I didn’t. I thought about keeping it to remind me of my mistake, but as time passed I felt sure I would never make that mistake again. I have a shop on ETSY, so I decided to sell it there and just say it’s a fake and tell how you can tell it’s a fake. Sunday, at about 9:00 PM, I listed the bag on Etsy with a title and a description that both said it was a fake. I priced it at $35. In the description I said, “don’t tell your friends it’s a fake and they will probably never know; if one of them says it’s a fake, just say “Yeah, I know, but I only paid $35 for it.” About 10:00 PM i got an email from ETSY saying the bag sold. I lost $95 on the deal, but I learned two valuable lessons. Lesson number one is don’t be too anxious to buy something at an estate sale. I should have done more research before spending $130. If I had I would have learned how to tell if a Chanel bag is real, or fake. Lesson number two is how to tell if a Chanel purse, or bag is authentic, genuine, or real. It’s so simple. Just look at the zipper pulls. 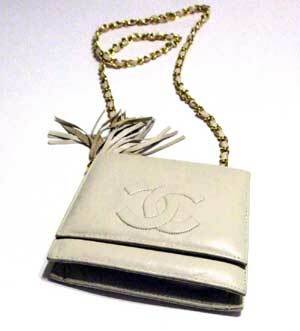 Genuine Chanel bags have “Chanel” imprinted on one side of the zipper pull and the Coco Chanel logo on the other side. I had to read through several web sites to find that little bit of information. Hopefully it might help someone avoid buying a fake Chanel bag. Amber, Coral, Ivory, Jet, Pearl, and Shell are all thought of as gemstones. Actually they are not really gemstones at all, because their origin is organic. are minerals with a crystalline structure. Amber, as beautiful as it is, is nothing more than the fossilized hardened resin, or tree sap, of the pine tree, formed approximately 50 million years ago, and is categorized as vegetable. Coral is a skeleton-like structure built by small marine animals and of course falls into the animal category. The best varieties of Coral are found in the Mediterranean, the Red Sea and off the coast of Japan. Colors range from bright to dark red to orange-red, orange-pink, pink, white, blue and black. In it’s natural state Coral is dull looking, but when polished it shines like glass. Ivory of course fits into the animal category. Fortunately the sale of Ivory has been banned worldwide since 1989. Ivory is no longer used in the manufacture of jewelry, or carved into figurines. Faux Ivory, made with polymer clay, or various resins is now used in jewelry, instead of genuine Ivory. Jet falls into the vegetable category. Jet, in it’s early stages is actually a type of coal called lignite, which is formed from fossilized wood. Jet is formed by the submersion of lignite in the mud of the seafloor for millions of years which is then compacted and fossilized. Jet as a gemstone was fashionable in the late 1800’s during the reign of Queen Victoria. quality and commands higher prices. Freshwater Pearls are normally more irregular and varied in shape than the saltwater variety. To further complicate the Pearl industry, there are natural Pearls and cultured Pearls. Shell is in the animal group of organic gemstones and encompasses a variety of sources. Shell can be from tortoise, oyster, abalone, and conch. Shell is probably the easiest materials to work with. You can cut it with a saw, or file it. You can carve it, drill it, or engrave it. Shell is probably the least expensive of all organic gemstones, because it is so plentiful. It is found in freshwater and saltwater; in oceans, rivers, and lakes. Alright, enough of the boring stuff about organic gemstones, or gems, or stones… whatever they are. I’m going to go photograph some vintage jewelry. Some with organic gemstones and some with mineral gemstones, either of which can be defined as Jewels. When the jewelry photos are completed, I’ll list the pieces for sale in my Etsy shop, https://www.etsy.com/shop/GuysandDollsFashion . Do you ever wonder if there’s a way to get a better price when you buy stuff at a garage sale. Well there is, and I’m going to tell you how I do it. Garage sales, tag sales, moving sales, and yard sales are all pretty much the same. We’ll talk later about Estate Sales. The first thing is, if you have two vehicles like maybe a BMW and a Toyota Corolla. Take the Corolla to the garage sales. The second thing is, don’t wear your Jimmy Choo pumps, your Marc Jacobs jeans, your Dior Cardigan, your Fendi Tote bag, or your Prada Sunglasses. You get the idea, no expensive designer clothes. Don’t look like you’re trying to keep up with the Kardashians… Even if you have some of that stuff that you bought at the thrift store, don’t wear it. If you do, don’t expect to get any real break on prices at a garage sale. Another important thing: When you see something that you really like, don’t go nuts over it. Don’t act like you can’t live without it. If you do, it will surely affect the price. If a seller has several things that you like, try putting them all together before you try to negotiate the price. That’s called bundling. Sellers are more apt to give a big discount on a large sale. It’s not rocket science. Leave your $60,000 car home. Don’t dress like your going shopping at Saks. Be nice to the seller, even be a little humble. If you try these little things, you will surely save yourself some money $$$$$$$$$. Some estate sales are conducted by surviving family members, and can be negotiated pretty much the same as a garage sale. The Estate Sales that are most difficult are those that are conducted by an Estate Sale Company. The Estate Sale Company usually has a staff of a few people that research things on the Internet, before pricing them. Many times when you try to negotiate a price they will tell you it sells on eBay for that much. Ask them if they looked at completed sales or active listings. Ask them if the price on eBay was in the color red, or green. Prices in green have sold. Prices in red did not sell. Chances are they looked at active listings and the prices they saw were asking prices, not what the item sold for. Let the seller know that you know that selling on eBay is a hassle. It’s not easy, and it’s not cheap. It takes time to take photos, write the description, and write out their return policies. Then there is a listing fee, a picture fee, a final value fee, and then PayPal takes their cut when the buyer pays for the item. Oh yeah, then the item has to be packed and shipped to the buyer. The Estate Sale seller would be better off to give you a 30 or 40 percent discount and be done with it. Eliminate all the handling and save some time. One more thing. Estate sales usually do give a large discount on the last day of the sale. Only problem is, most of the good stuff will probably be gone by then. For all of us that live north of the equator, last Friday, September 23, 2011 was the first day of Autumn, or Fall. Know what usually happens in the Fall, other than leaves changing color and the temperature dropping? For many communities around the country it is time to have their last garage sale of the year. The holidays are coming, and with the economy the way it is, people will be selling some nice stuff to make extra money for the coming holiday season. Money for Gifts, for Parties, for Fairs/Carnivals, and for Family Feasts. And sometimes people sell stuff just to make room for more stuff or different stuff. In the next few weeks there will be a plethora of Community Sales, Church Bazaars, Yard Sales, Garage Sales, throughout the country. What an opportunity to grab some really great bargains and have some fun. Now that the temperatures are dropping a bit, people seem to be in a better mood and more friendly. Don’t be surprised if you find some Pumpkin Muffins, Banana Nut Muffins, or Blueberry Muffins, and Hot Chocolate or Hot Coffee at some of the sales over the next few weeks. When the final sale is over many sellers will be determined to get rid of the leftovers and will take the stuff and donate it to their local thrift shop. It will certainly be worth your time to check out your neighborhood thrift store early each week, for the next few weeks. Another thing you might want to do after those final sales is cruise those neighborhood streets in the early morning on trash pick-up day. You’ll be amazed at what people put in the trash when that last sale of the year is over. And people usually put the stuff on top of the trash bin, because they hate to throw it away and they’re hoping someone will take it. Some of the things I’ve found in the trash include a nice old 1940’s Philco Tube Type radio, a Victorian Parlor Chair, and an old Art Deco Style Electric Toaster. I still have the radio, it works and it goes good with my decor I sold the chair for $200 and sold the toaster for $35. I went to an awesome Estate Sale last Saturday and bought over 100 pieces of Estate Jewelry. If all goes well, tomorrow I’ll be listing some of it in my Etsy shop, Bourbon Street Vintage and time permitting, I’ll be blogging about it here. Hand picked Antique and Vintage goods for your home…. Take your time and look around. You'll find some rare and unique things that you can't get at Macy's. Visit Guys and Dolls Fashion Boutique for fashionable vintage apparel, shoes, and accessories for men and women.